April 12, 2016—–The Ogallala Aquifer is at risk of drying up! The aquifer, which is part of the High Plains Aquifer, underlies portions of 8 states, South Dakota, Nebraska, Wyoming, Colorado, Kansas, Oklahoma, New Mexico and Texas, and spans 175,000 sq. miles in the midwest United States. Water from the aquifer has many uses but irrigation uses the majority—57 million gallons per day! The Ogallala also supplies approximately 82% of the drinking water for the overlying states. 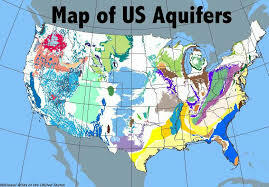 The Aquifer lies beneath 8 states. Large scale extraction of water from the aquifer for farming purposes began after WWII due to improved farming methods and farm equipment. About 27% of the irrigated farmland in the U.S. lies over the aquifer. Currently the farmland above the aquifer produces about 1/5 of the beef, corn and wheat consumed in the U.S., but the water is depleting faster than nature can replenish it according to an ongoing 60 year study. In some parts of western Kansas wells have totally dried up! Between the years 2000 and 2008, 25% of the Ogallala Aquifer has depleted from levels of the early 1800’s. Once depleted the aquifer will take over 6,000 years to replenish naturally from rainfall. A 2013 study forecasted that the High Plains Aquifer, which the Ogallala makes up the greatest portion, would be 69% depleted by 2060.The Ogallala is recharged by rainwater but only about 1 inch of precipitation actually reaches the aquifer annually. Recharge of the aquifer ranges from 0.024 inches per year in Texas and New Mexico to 6 inches per year in parts of Kansas, but hundreds of thousands of years of rainfall will be needed to replenish it back to its levels of the early 1800’s. U.S. Aquifers are being depleted. Solutions? Farmers can either conserve water and extend the life of the aquifer or choose to deplete it. Farmers can dig deeper wells if they run out of water, but the cost has to be determined because eventually deeper and deeper wells could cost more than the income from the crops. The North Plains Groundwater Conservation District in Texas has introduced a new project to conserve water. Participating farmers grow corn with just over half of the water they would normally require to irrigate the fields using pivot sprinklers rather than the water consuming drip system and they plant crops farther apart to help conserve water. Many farmers are choosing the dryland farming method which uses crops that are drought-resistant and conserve moisture without irrigation. Such crops include sunflowers and winter wheat, but these crops produce less income than crops from irrigated farming, so pressure is on many farmers to keep pumping. What is happening to the Ogallala Aquifer is also happening to aquifers in Africa, Asia and the Mideast. Again, just as the population of our earth is exploding, our aquifers are becoming contaminated and depleted, taking thousands of years to refill. We need to conserve our groundwater to sustain food production for an increasing population. In Kansas and Nebraska, groundwater belongs to the public. Water rights are granted to property owners by the state, which assign a certain amount that can be legally used—-but what’s available on paper often exceeds what’s left in the ground! Farmers often feel the water is legally theirs to use until it’s gone! In the past several years many farmers have retired from crop farming, leasing their land to wind energy. Outside Friona, Texas, northwest of Lubbock, Wesley Barnett leases wind rights on his land to an energy company. The going rate runs about $10,000 a year per turbine. Barnett says he can’t water his land anymore so for some people, wind is a lifeline. Categories: Building Green, Climate Change, Population | Tags: #Ogallalaaquifer, #renewableenergy, Population | Permalink. Do you have any data in regards to the actual volume of water today as compared to the 1800’s? I find it frightening to think that since than, our population in America has increased by about 295,000,000, while our water has decreased. I would like specific details for a debate I will be having in an environmental sustainability course I am taking. Thank you.